The storm that blew through here on Monday and caused all of the schools in the area to have another snow day (that's 5 or 6 for most of them), then crashed into the storm on the east coast causing chaos over there, luckily only dropped 3-4 inches on our area. 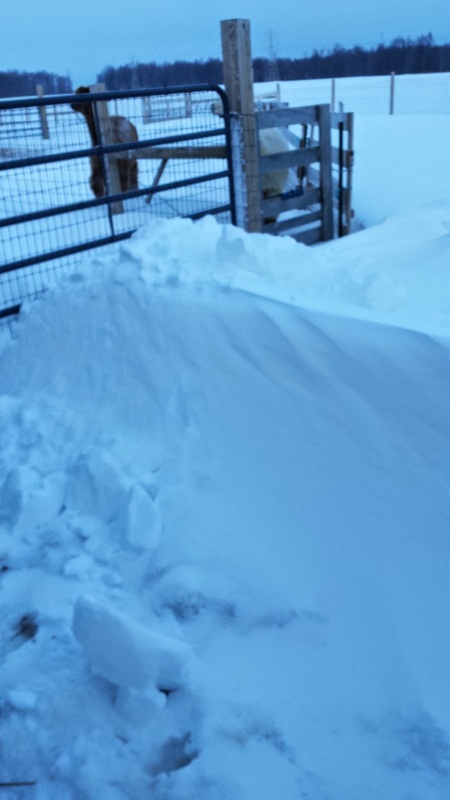 The worst problem out here in the sticks were the 3 foot drifts across the drive way and in front of the barn doors. By Tuesday morning the roads were all clear but we awoke to another visit from the Snow Queen and everything looked like an icy wonderland. Even the fences were lacy with ice crystals. Callie's "Charlie Brown" Christmas tree that she still hasn't taken down off of the roof of her dog house was frosted with the frozen fog crystals and looked almost pretty. Rich insists on putting the mangled little tree up each year and I must admit that it is an endearing sight out there on the frozen tundra of our back yard! Dear friends of ours have recently become grandparents for the first time so I took advantage of being snowed in and used the yarn made from Mango's baby fleece to knit a sweater for their new little granddaughter. This is a creamy white sport weight yarn from Mango's first shearing and it worked up into a lovely soft sweater that will not irritate tender baby skin. We have this yarn for sale out here at our farm store or on our Etsy store. The pattern is the 5 Hour Baby Sweater from Ravelry.com. If you are a knitter I highly recommend that you register on Ravelry.com. It is an on-line community of knitters and is full of free patterns and other record keeping tools for your knitting projects. The pasture "girls" are all doing well and even on the worst nights prefer to sleep either in the open barn doorway or right out in the barnyard. Nikko, our herd sire, takes his responsibilities seriously and usually sleeps in the little sheltered area just on the other side of the fence from the girls even though he has a perfectly snug 3-sided "condo" on the other end of his pasture. Asterius and Brutus, our yearling males usually sleep in their condo in the center pasture. I can always tell which animals have slept out in the open because of the amount of snow or frozen fog on their backs in the morning when I go out to feed them. When we first got the animals three years ago, Rich and I worried all winter long about them sleeping out in the open. We have come to realize that the snow on their backs is a good indication that their fleeces are thick enough to prevent them from losing body heat. Even little Mocha, the baby of the herd, seems unfazed by the snow and cold weather. The frisky little four-month-old leaps about in excitement when I pour out the food in the morning. He is always eagerly waiting in the front of the pack at the gate when he hears me open the barn door. When I'm suiting up to go out to feed them on these zero degree mornings I grumble that these animals aren't so cute in the "bleak midwinter," but once I get out there they always make me smile.